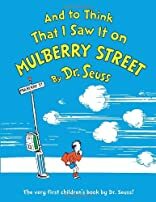 And to Think That I Saw It on Mulberry Street was written by Dr. Seuss. And to Think That I Saw It on Mulberry Street was published by Vanguard Press. 5/5/2009 Matthew Gomez said: Just like the name indicates, it's "Classic Seuss." I recall reading this over and over again while waiting for piano lessons. An inspiration. 7/5/2008 Andrea White said: Dr. Seuss is a genius! His love of language is evident in the musicality of his prose. First graders love him!